You are looking for natural ways to prepare for conception and improve your fertility and increase your chances of conceiving. You would like to renew your sense of sexuality and feminine wholeness and increase authentic intimacy with your partner. You want to feel good about your body, calm your mind and nurture a positive self-image. You would like to restore your sense of control with simple steps to take charge of your reproductive health. Whether you are just beginning this journey or have been struggling for a while Fertility Yoga can help you prepare for pregnancy and Motherhood. Through, yoga, meditation and self-nurturing mind body tools you will discover ways to relieve stress, let go of negative thinking and nourish your reproductive well-being. Receive messages from your "baby to be" with an intuitive reading & healing session. Calling all yoga teachers. Learn how to teach a soul mind body approach and offer Fertility Yoga classes in your area. 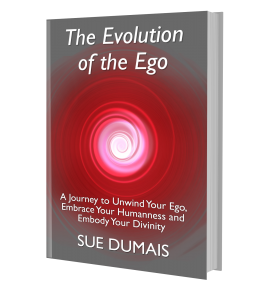 "The Evolution of the Ego ~ A Journey to Unwind Your Ego, Embrace Your Humanness and Embody Your Divinity"
"Wow…I can’t thank you enough for your love, support and kind words. Although we’ve only known each other a short time, I feel so connected to you…you are a true friend!" "I want to thank you for all of your love and support from the moment I met you. I think all of the lifestyle changes I’ve made in our infertility journey are what are allowing us to make this decision to pursue adoption. It feels so right! Thank you, Sue!" "Words cannot express the gratitude I feel for having Sue come into my life. I think that everyone going through this journey would benefit from her warmth, openness and understanding. Her presence is so calming, especially when the treatments and related sense of responsibility can seem so overwhelming. Through Sue`s expertise and guidance I was able to connect with my baby and be hopeful, relaxed and calm during my egg retrieval, embryo transfer and the 2-week wait. Working with Sue has helped me to get to a place where I know that everything will be as it should be - regardless of the outcome. What this has done is allowed me to release my fear and to welcome a baby into my life - a shift in my thinking that has been life-altering. She has truly been a gift to me." "When I first came to your studio I felt so incredibly alone but I quickly learned just how far from the truth that was. To be in the presence of other women who truly understand the heartache associated with infertility was a true gift and it gave me such strength when I needed it most. Through many tears and much laughter, you have helped me to accept, to be playful and above all, to believe. And for this, I am truly grateful. Thank you!" 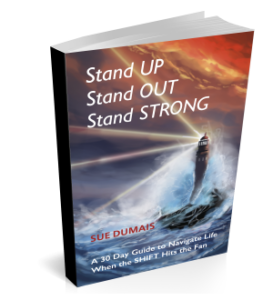 "Sue, you have been an amazing gift to my life. I am truly a better person after having has the incredible experience of being trained by you. You are an incredible trainer, I’ve met a lot of them and none compare to you. It’s not only your knowledge, but your soul and your spirit that shine through and truly inspire! You are like an angel on earth giving light, happiness and health to everyone you touch. I cannot express the amount of gratitude I feel. From the bottom of my heart, thank you!" "Sue, it was lovely meeting you at the Yoga for Fertility Instructor Training. What a truly Thank you for sharing your knowledge and your energy! I feel so blessed." wonderful course, I am still going through everything we covered finding it fascinating." 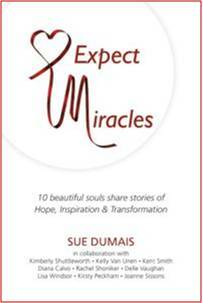 "Stand UP Stand OUT Stand STRONG ~ A 30 Day Guide to Navigate Life When the SHIFT Hits the Fan"
"Expect Miracles! 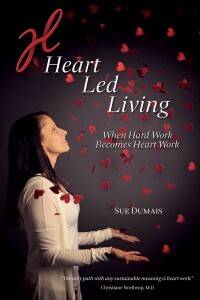 10 beautiful souls sharing stories of Hope, Inspiration and Transformation"
"Heart Led Living ~ 10 Principles to SHIFT Consciousness From Head to Heart"